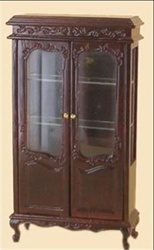 Mahogany China Cabinet with beautifully carved molding. Vintage piece in excellent condition with a good finish. Has glass side panels for viewing items inside double glass front door opening with two glass shelves and one wood self. Measures 6" H x 3-1/8" W x 1-1/8"